Scary Terry's World: How MONSTER MEMORIES are made. How MONSTER MEMORIES are made. For quite a long while now, I've been creating the cover art for SCARY MONSTERS magazine and its annual MONSTER MEMORIES edition. 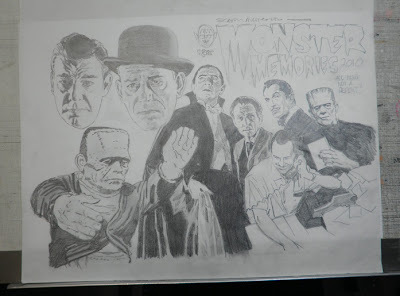 Over the past two days, I produced the wraparound cover art for the upcoming MONSTER MEMORIES 2010 issue. I thought it might be fun to follow the process. It begins with an email from editor/publisher Dennis Druktenis outlining all the images and copy he'd like on the cover. 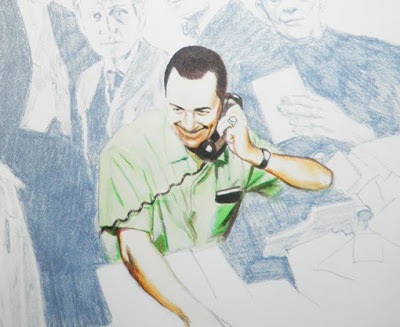 As this issue contains a previously unpublished interview with the late Forrest J Ackerman, Dennis sent along multiple photos of Forry in his cluttered office. 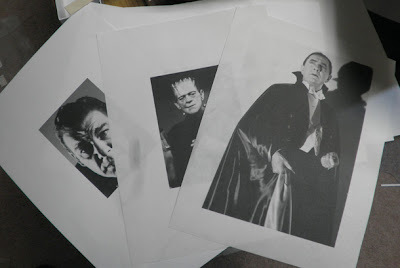 For the movie monsters/actors depicted, I searched my collection and the web for appropriate reference photos. On this cover we have Boris Karloff as the Frankenstein monster, Bela Lugosi as Dracula (from Abbott and Costello Meet Frankenstein), Vincent Price, Peter Cushing, Lon Chaneys, Senior and Junior -- and Aurora model kit "Big Frankie." The next step is a rough pencil layout -- which I neglected to take a pic of -- but it's just a bunch of squiggles anyhow -- you're not missing much. I then drew all of the cover-featured creatures in pencil -- roughing in the logo and placement for some of the cover copy. 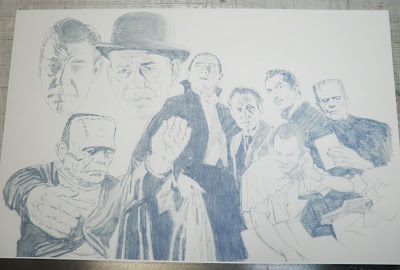 I scanned this image, dropping out the rough logo and copy, and using Photoshop, altered the pencil tones to a light blue. I then printed this onto bristol board. 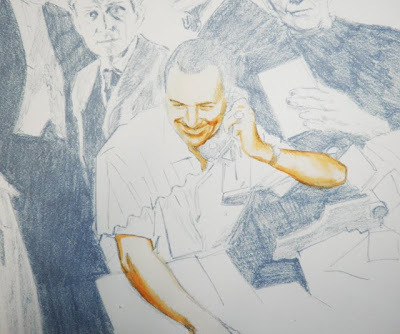 Using colored inks, I started working on "Uncle Forry." Here we are a little further along. The next step was to scan this and start playing with contrast, hue and saturation in Photoshop. I bumped the blue up to a darker purple and tried a greenish background color. I liked that -- but maybe orange would look better? Yup. Next step was to hand draw the logo, scan it and combine it with the already existing illustration. More fussing with color -- a deeper reddish orange for the background, and a little more contrast saturation on that purple. A little "Sam Scare" head was added by the logo, as well as all the cover copy requested by Dennis. A few minor tweaks, and it's done. Look for the cover below on your newsstand in the not too distant future! 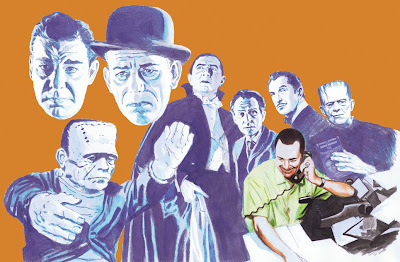 Labels: Bela Lugosi, Boris Karloff, Bride of Frankenstein, Dracula, Forrest J. Ackerman, Lon Chaney Jr., Lon Chaney. 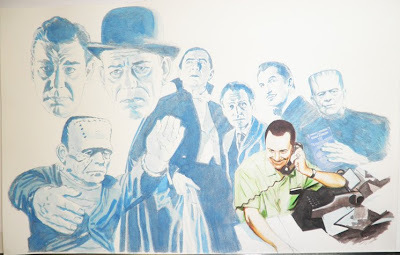 Sr., Peter Cushing, Scary Monsters, Vincent Price. Whoa, that turned out really great, Terry. How beautiful! Forry lives again! Wonderful job, Terry! I loved the comparative portraits of father & son Chaneys! !